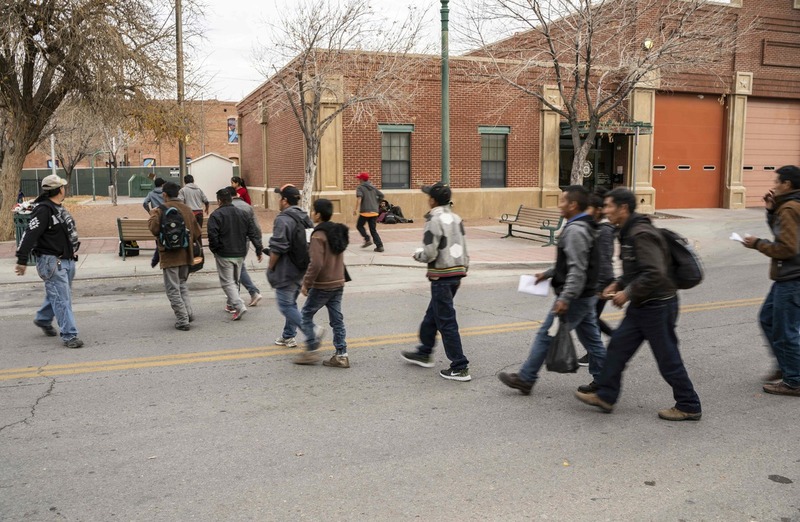 ICE Continues To Release Hundreds Of Asylum-Seekers Into Public Park In El Paso, Texas Officials appear to have resumed coordinating with local shelters after days of dropping off hundreds of mostly Central American migrants without any plan. About 200 Asylum seekers were dropped off by ICE as part of a wave of mass releases over the Christmas holidays, which began on the night of December 23. "I grew up Catholic... So it seemed like a no-brainer. There are people who are hungry, who don't have a place to stay....and it's Christmas," Schmidt added. Beginning on Sunday and continuing into Christmas Eve, ICE dropped off approximately 400 migrants near the Greyhound bus terminal with no apparent plan in place for the men, women and children. Typically, ICE coordinates with local shelters whenever the agency's processing centers are over capacity. But this time ICE failed to contact them in advance, and has continued to bus the mostly Central American immigrants to the public park, leaving them completely reliant on generous strangers who have been showing up in droves to distribute food, water and blankets as temperatures drop into the 40s. But by Christmas afternoon, when 134 immigrants were released by federal agents, ICE had resumed communications with local aid organizations who are now transporting the migrants to nearby shelters. 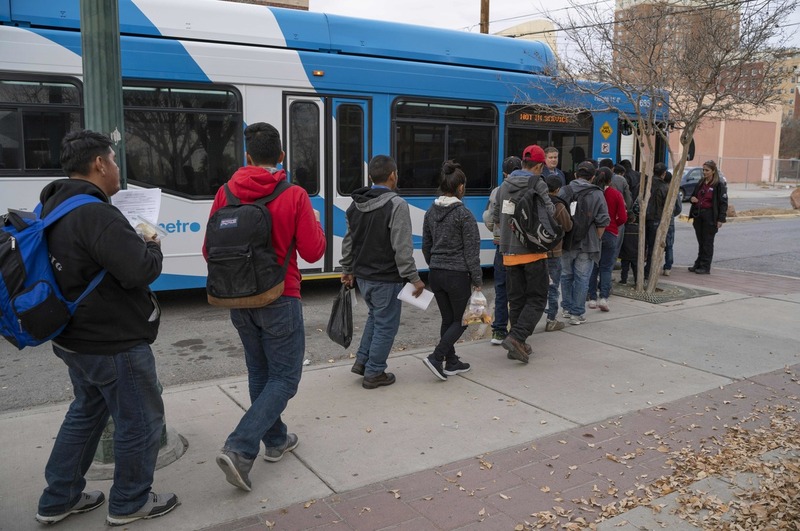 Central American migrants are making their way to El Paso Sun Metro busses after being dropped off in downtown El Paso by Immigration and Customs Enforcement late in the afternoon on December 25, 2018. It is unclear why ICE stopped coordination efforts with shelter groups and immigrant advocates. Officials could not respond to NPR's requests for comment due to the government shut down. An automatic email response from the agency explained, "All of ICE's public affairs officers are out of the office for the duration of the government shutdown. We are unable to respond to media queries during this period because we are prohibited by law from working." Dylan Corbett, who heads a local aid group called Hope Border Institute, told NPR that one of the ICE authorities present at the scene said 'I have a heavy heart, I'm a human being, but I'm following orders.' "
Also on Tuesday, an 8-year-old boy from Guatemala became the second child this month to die while in the custody of U.S. Customs and Border Protection. The boy, whose name has not been released, died shortly after midnight at a hospital in Alamogordo, N.M.
Rep. Beto O'Rourke, (D-Texas), told CNN that ICE was expected to drop off another 200 on Wednesday bringing the total number over four days up to 800. The migrants who are released must appear before a severely backlogged immigration court at a future date. In the meantime, some are traveling to meet relatives elsewhere in the country. Dawn Vigil, a teacher at the University of Texas at El Paso, helped transport migrants from shelters back to the bus station. She described what it was like to encounter the families face-to-face: "Heart-wrenching and heartwarming at the same time." "You see it on social media, you can read about it...but actually being witness is incredibly powerful," Vigil told NPR, adding, "That made me just full of love."